Certain restaurants like to suggest specific wines that go well with particular dishes. The crisp, citrusy, Sauvignon Blanc to go with a dish of lemon sole, or the full bodied, smokey Malbec to go with a sirloin steak. The flavours of the wine and the dish are often said to mutually reinforce each other, such that the combination is greater than the sum of its parts. Passing through an airport bookshop earlier this month I made a lucky spontaneous decision that demonstrated a similar effect is possible in the literary world. So I thought I’d share my discovery with you: I picked up two books, one fiction, one non-fiction, and they complemented each other perfectly. I would wholeheartedly recommend the following pairing. 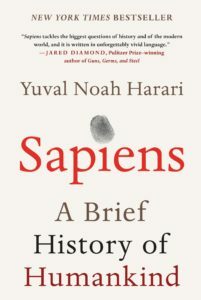 Over the past twelve months or so I’ve seen lots of people wielding a copy of Yuval Noah Harari’s SAPIENS – A Brief History of Humankind in planes, trains and automobiles. When everybody seems to be reading a certain book it always piques my curiosity. Either the marketing campaign was particularly effective or, more likely, each person who chose to buy it had been recommended it as a good read by a handful of people. As regular readers of this blog will know: I’m a sucker for Wisdom of the Crowd. And it did not let me down on this occasion because SAPIENS is an absolute cracker. A huge volume of well-packaged, condensed, easy-to-assimilate information that touches on the major milestones in our species’ prehistory including our encounters with other, now extinct, human species, the agricultural and industrial revolutions, and a wide variety of human empires that rose and fell through the ages is presented with great speed, style and finesse. The most gob-smacking revelation for me, overall, was mention of the genetic evidence suggesting that a fair chunk of European human DNA is of Neanderthal origin and a sizeable portion of Asian human DNA originated in the Homo erectus species. We’d covered a science story on the fact that Neanderthal’s were to thank for the keratin in our hair and nails on the Geek Chic Weird Science podcast, but I’d presumed that this was the case for all Homo sapiens, not just the European ones. The concept that the human species with which our ancestors had sexual dalliances differed according to whether the Homo sapiens in question happened to reside to the east or the west of the Eurasian land mass came at me like a bolt from the blue. 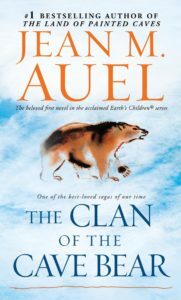 Jean M Auel’s Clan of the Cave Bear is the first book in a series of works of fiction describing an orphaned Homo sapiens girl being adopted into a Neanderthal tribe. Access to evidence regarding how Neanderthals behaved, what they believed and the extent of their knowledge is inevitably scant given how long ago they were wiped off the face of the planet. But Auel’s account of their superstitions, social organisation and rigid thought processes seemed entirely plausible. I’ve always been a great fan of Bernard Cornwell’s books. I love his approach of sticking faithfully to the historical record regarding the Saxon and Viking invasions of Britain wherever it is available, but filling in the gaps with reasonable fictions that are entirely compatible with what is known from those times. I got the distinct feeling that Jean Auel takes a similar approach. Even when the storyline became slightly fantastical as the tribal witch doctor communes with the ancestral spirits to seek advice on the best course of action, the brews concocted by their medicine woman were certainly based in fact. And speculations regarding differences in the cognitive abilities of Homo sapiens and Neanderthal’s also seemed reasonable given what we can glean from the skulls in the archaeological record. Frustratingly, the further back into the history of our species we peer, the greater the uncertainty regarding the actual facts. I personally found the pairing of the facts presented in Sapiens A Brief History of Humankind with the fictional accounts of the nature of interactions between Neanderthals and Homo sapiens in The Clan of the Cave Bear to be an absolutely delicious antidote to this problem. And I hope you do too!